Key West Pottery at Latitudes Supply Co.
Key West Pottery @ Latitudes Supply Co. While our new shop at 24 North Hotel has all the essentials you forgot to pack, it also offers handiworks by local Key West businesses for purchase. 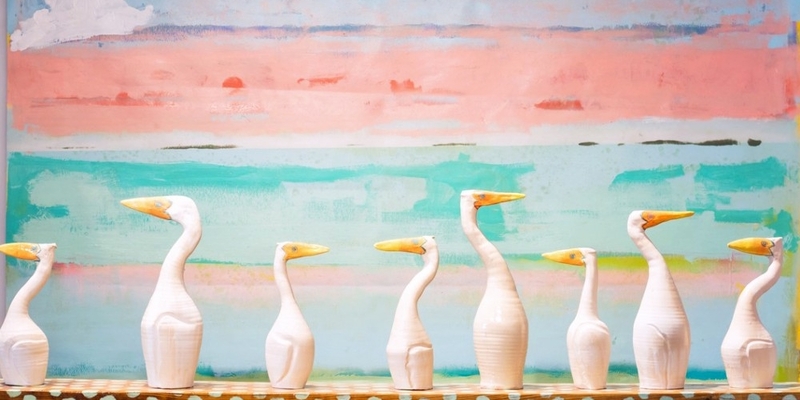 Whether you’re shopping for yourself or gifts in Key West, we recommend you check out pieces by Key West Pottery, which creates functional pottery and art that is unmistakably Key West. Their art features images of gators, the notorious Key West roosters, pelicans and more. The Old Town-based ceramics company opened shop in 2010 and is owned and operated by husband and wife duo. Their works accentuate playful, colorful and practical designs that show a purely Key West motif. Key West Pottery ceramics make for the perfect souvenir so that Key West will always have a place in your home. Check out @keywestpottery on Instagram for their latest works and videos.